Spectral Blade is a Primary Wizard skill unlocked at Level 11, dealing powerful damage in melee range. This is a Signature spell. Signature spells are free to cast. Each cast of this skill creates several slashes in the air in front of the wizard. These overlap and intersect, potentially striking multiple enemies multiple times. The skill is more effective the closer the target is, with three hits per enemy almost guaranteed at melee range. Spectral Blade is used for Wizards willing to meet their enemies toe to toe. It's a powerful melee spell that can land multiple hits per enemy. The drawback is that it only works at fairly close range, and that's a dangerous place to be for many Wizard builds. Refer to the Spectral Blade rune effects article for thorough descriptions of all five rune effects in this skill, including screenshots, videos, and strategy tips. Zombies get harvested in a zoomed in view from a graveyard. This skill works very well at low levels, since it can land 2 or 3 hits on the same target. It was set as the default left click attack in the BlizzCon 2008 build, and was used heavily in the BlizzCon 2009 demo as well. There is a slight casting delay on Spectral Blade, making it too slow to stun lock enemies. A Wizard who uses this one at the point blank range where it's most effective will be hit back by any targets who do not succumb to the first assault. The skill was changed during development, and as of the beta test (October 2011) the Wizard's weapon damage is a key component in the damage delivered. During beta testing, Clvl 13 Wizards did around 5 per slash with weapon weapons, and more than 20 with bigger axes and mauls. The possible damage will obviously increase greatly with better equipment and higher level characters. As of the beta test, Magic Weapon does not increase the base damage of Spectral Blade, but does improve the damage of critical strikes. This is thought to be a bug. 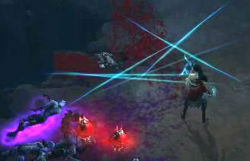 Early in the Diablo 3 Beta, Spectral Blade was the only Wizard skill to incorporate the weapon damage into the spell damage. Flux did extensive testing of the skill with various weapons and posted the results in his Wizard Gameplay Report. Screenshots showing the damage output with the various weapons used can be seen below. Adventuring War Axe of the Leech. It’s not a spell that can be used machine gun style though, even if enemies are in range. There’s a short delay after each cast, a cool down that’s longer than the Wizard has with her projectile spells. As a result Spectral Blade doesn’t look like a real boss-killer. It also didn’t seem to stun or interrupt the attacking motion of monsters, the way melee attacks sometimes did, so it’s not a way to render targets helpless while you slash them to bits. Last year, 3 hits were usually granted on point blank targets, while enemies at the edge of the skill’s range (who were generally not yet in melee range of the Wizard) were most likely to take just a single hit. I didn’t actually use this one much, with so many other, more interesting spells on offer, (and since I very seldom allowed enemies to get into melee range) so I can’t say if it really does always hit three times, but it was very effectively putting down almost anything I hit with it. I used it a few times in the demo this year; it did potentially more damage than MM, even with fewer skill points, but the melee range thing isn’t what you want to be doing with a Wizard. Better you kill them from a distance with MM than use a slightly more damaging skill at melee range, when they can hit you back. Being hit is for grunting meat shields like Barbarians and Monks; sophisticated classes like Wizards don’t like to get their uniforms smudged by filthy monster paws. Skill tiers were removed for the July 2011 Press Event, allowing skills to unlock steadily from levels 1 to 30. Consequently, all skill levels were adjusted and Spectral Blade became a level 5 skill. Spectral Blade remained a level 5 skill when the beta started. With the Beta Patch 8 of December 2011, all signature spells became free to cast; also, Spectral Blade was moved up to level 6. With the Patch 13 changes, it was classified as a Primary skill and moved to level 9. For March's Beta Patch 14, it was moved up to level 11. See the Wizard skill archive for more details on previous versions of Spectral Blade and other Wizard skills. Or see Spectral Blade (BlizzCon 2008) for the original version of this skill. Mirror Images casting Spectral Blades. Improved Spectral Blade is a retired skill whose only purpose was to increase the efficiency of Spectral Blade. Skill runes made it unnecessary. This page was last edited on 15 April 2015, at 17:12.